Corey Robin explains how the Democrats came to be the party of fiscal responsibility. During the 1980s, the Republicans cut taxes and ran up huge deficits. Then Bill Clinton came into office and announced his intention to reduce deficits. Anxious to appease Robert Rubin and the bond market, he abandoned whatever pretense of a progressive economic agenda he had set out during the campaign. He and the Democrats raised taxes and allowed government spending to decline dramatically as a percentage of GDP. By the end of his second term, Clinton had managed to generate a surplus—with the explicit purpose of not only reducing the debt but also shoring up Social Security—only to have the Bush White House squander that surplus through massive tax cuts and increased military spending. 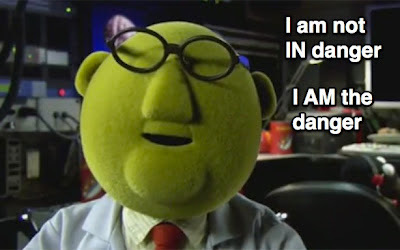 So in the update of the format of my blog, a number of old posts have just plain gone missing, with no rhyme or reason. I've not been watching The Newsroom despite my unreasonably vigorous love for Aaron Sorkin's writing because HBO are numbskulls and won't take my money. But I've been catching clips that people have been circulating and I've been unimpressed by them. Take the very first scene, which really made the rounds. It's a gorgeous piece of television, no doubt. Sorkin's article How To Write an Aaron Sorkin Script, by Aaron Sorkin article explains some of why, in some justifiable bragging. I'm not immune to the flavor of patriotism it's playing on. But “we fought for moral reasons, we passed and struck down laws for moral reasons”? That's a self-satisfied misreading of American history that I would like to believe ... but I regard it as dangerous precisely because it's such a tasty thing to want to believe. OK, that's satisfying for a lefty like me for the obvious reasons. A selection of the progressive blogosphere's greatest hits set to music? Oh yeah. But why do we get Will McAvoy telling us that he's a Republican, that the Tea Party don't represent the real Republican party? It's not just Sorkin trying to hide that he's cribbing from the left-o-sphere again. There's something else. I presume that Sorkin is trying to preëmpt a criticism that he's just portraying Republicans as a bunch of mustache-twirling villains. See, he protests, my protagonist, the hero of the show, he's a Republican! But to do that we have to believe that there are a great many McAvoys out there who are shocked, shocked to see these right-wing crazies sweeping in and claiming the mantle of the Grand Old Party. Yet the Tea Party is the Republican base who have formed the core of Republican ideology and electoral strategy since Nixon. Anyone paying attention should know this, but Will McAvoy, supposed ace newshound and teller of truths, doesn't. I smell another manifestation of the Cult of Moderateness. You see Jon Stewart hint at it. 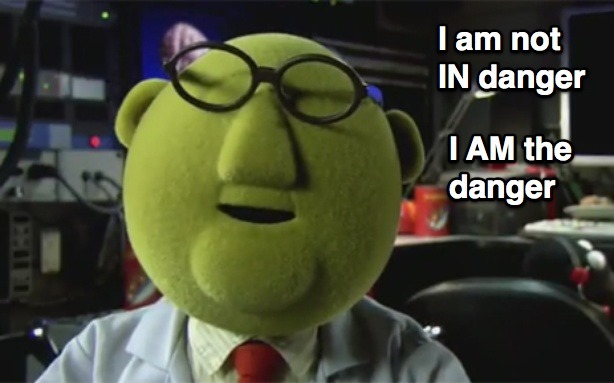 It's the animating spirit of Obama-ism. If we could just tone down the crazies on both sides, American politics could be reasonable and we could work out our differences. It's a tasty thing to want to believe. But it's not true. When presidential candidate Barack Obama presented himself to the black community, he was not to be believed. It strained credulity to think that a man sporting the same rigorously managed haircut as Jay-Z, a man who was a hard-core pickup basketball player, and who was married to a dark-skinned black woman from the South Side, could coax large numbers of white voters into the booth. Bonus: Up With Chris Hayes has a panel discussion about the essay featuring an awesome line-up of panelists: Coates, Hayes, Melissa Harris-Perry, W. Kamau Bell, and Jay Smooth. So I've done a major refresh of the design of this blog, which I've been meaning to do for ages. The old design was built using the original Blogger templating feature, which was phased out in favor of a more sophisticated system, but I hesitated to make the switch for years because I had done so much tinkering with the template. But I really want to take better advantage of post labels, and to not have to edit the template every time I want to tweak my blogroll, and this will facilitate that. At least I got it to set text width in ems, not pixels. The Encyclopedia of American Loons currently indexes about 350 people promulgating absurd ideas, from familiar faces like Sarah Palin and John Edward to folks who should be familiar like James Dobson to relatively obscure crackpots like Rashid Buttar and Adam McLeod. Each entry provides a succinct overview and links to more resources. The Tenderloin neighborhood in San Francisco is an exceptionally skeevy slum that often catches travelers by surprise, because it lies just a few blocks from the posh Union Square district. When I lived downtown, I routinely stopped tourists who were about to blunder into the neighborhood and turned them around. For the convenience of a friend, I've created a little map showing Where Not To Go. 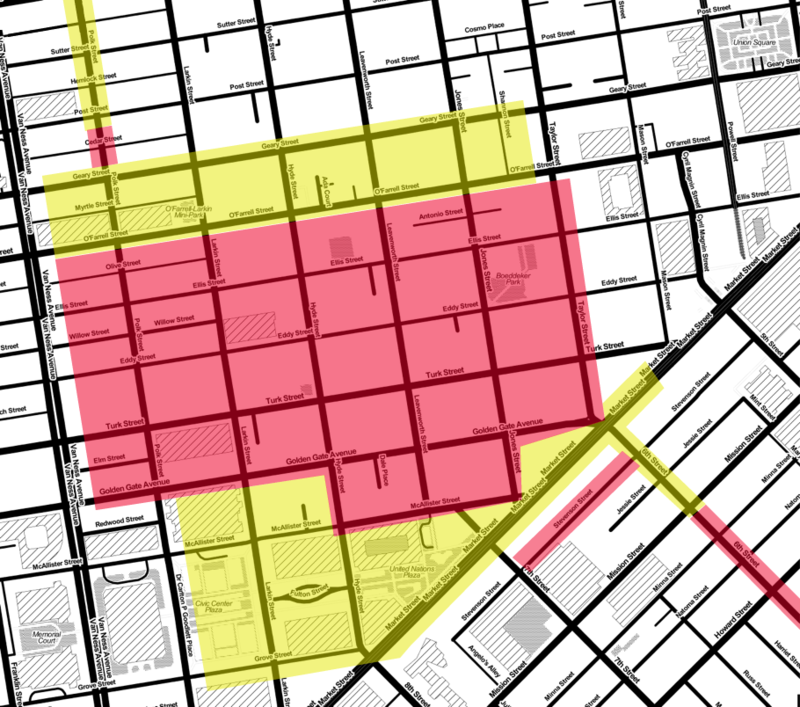 The areas marked in yellow are often scruffy but not scary, though I'd recommend staying out of them at night. 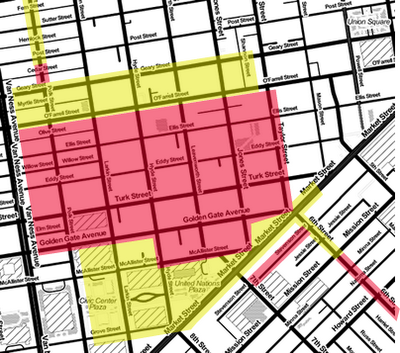 The areas marked in red are places to avoid, period. I have also created a much bigger version of the map. Just before Governor Romney chose Ryan as his veep running mate, The New Yorker did a profile of Ryan. Paul Krugman provides an thumbnail sketch of the Paul Ryan “plan”, including some links to other resources and making clear the lack of There there. See also Krugman's column taking down Ryan as An Unserious Man. Ezra Klein at Vox argues that Paul Ryan isn't running for President. He's after something bigger. In case you're puzzled, that's a math thing. Also: It turns out you can build a Turing complete computer out of Magic: The Gathering cards. Whoa. The Martini FAQ goes above and beyond the call of duty. Strict adherence to the Prescriptivist position brings with it several undeniable benefits. Foremost among these is the quality of the drink itself: it is difficult, perhaps impossible, to truly improve on the classic American Dry Martini. There are also practical benefits, since the Prescriptivist has no need to stock an elaborate bar. Give him an ample supply of the two base ingredients and a fresh stock of garnishes, and he's set. Finally, there is the bracing sense of keeping the barbarian at the gate, of shielding a flickering flame of culture against the gusts of fad and fashion. Yes, you're reading that right. It has footnotes. And yes, of course I'm a Prescriptivist. Vermouth. More gin than vermouth. Chilled. Twist or olive. Cocktail glass. Straight up. Cocktail glass. That's it. If you add apple-flavored goo, it's now an Apple Cocktail. 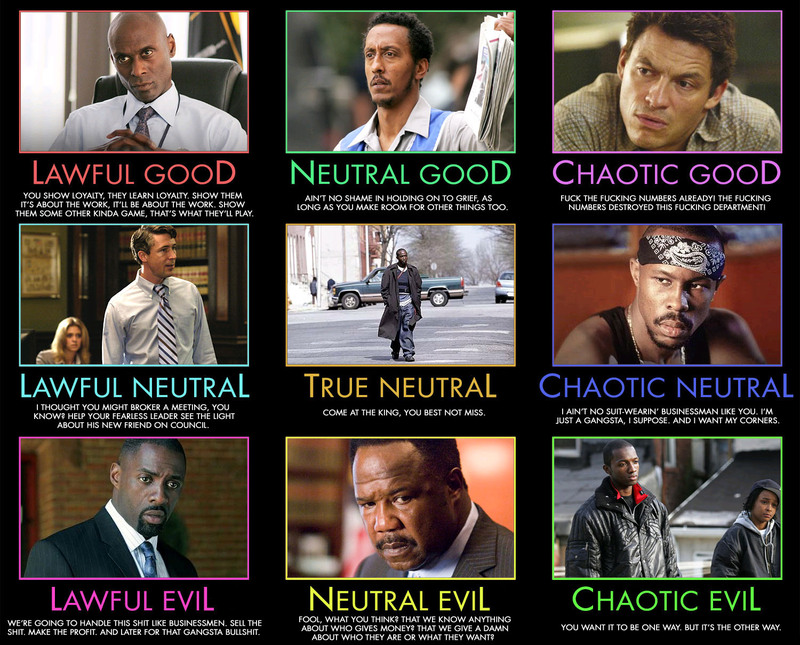 It's a tricky exercise, precisely because The Wire has a complex morality. I made a point of playing against type and putting a cop in the evil row, though I couldn't quite get a gangster into the good row. 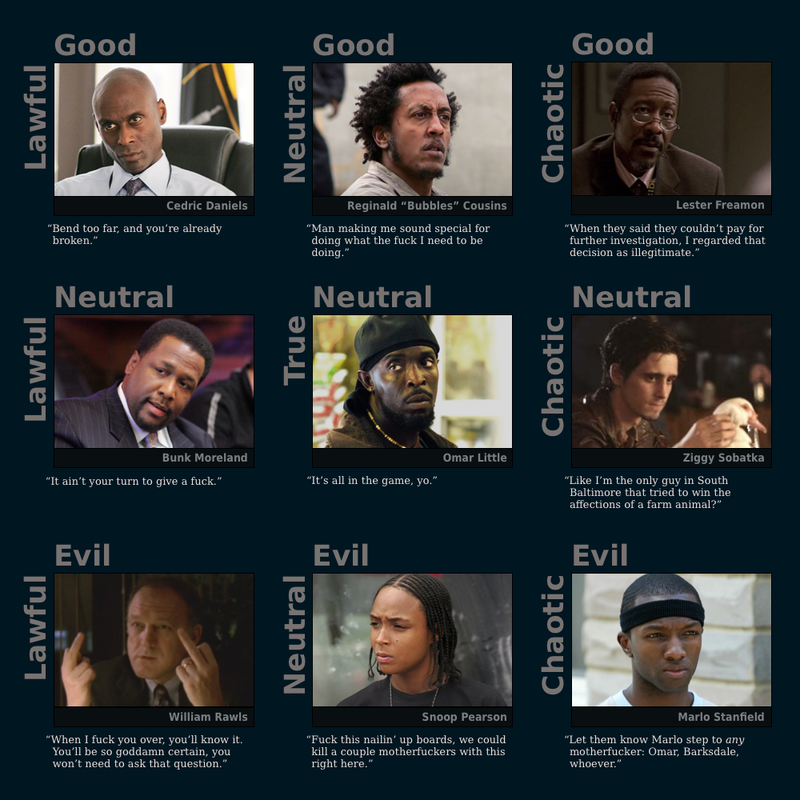 I tried to find character quotes which represented both the alignment and the character well. Cool tools is Kevin Kelly's index of reviews of all kinds of things ... including lots of unusual books. Most reviews talk not just about the qualities of the product, but about how and why it's useful, like tongue depressors or those glue sticks made of post-it note glue ... and many tools are just tips and tricks that don't require buying anything. The Wirecutter is a useful index of reviews of tech products and more. Better Living Through Design is an index of spiffy things. The bags and desk accessories are my particular weaknesses. Macrumours' buyers guide helps you guess when an Apple product will come out, reducing your chances of getting something and then feeling frustrated to see a spiffy new version released right after you buy it. Jetpens sells, well, pens, and they have a bunch of weird cool ones if you're into that. Garrett Wade sells absurdly beautiful tools. The garden implements make me almost want to take up gardening. Kaufmann Mercantile is a bit like Garrett Wade, offering not just tools but a range of well-made housewares and “accessories” and whatnot. Saddleback Leather make exceptionally handsome, sturdy luggage. My current gig calls for me bringing my laptop home pretty frequently, so I needed a backpack but wanted one that looked like it belonged to an adult; people comment on the one I got from them all of the time. Thinkgeek, TopatoCo, bOing bOing, and Unemployed Philosophers' Guild offer a range of nifty/cute/clever tchotchkes. Caveat emptor about the more eccentric electronics on Thinkgeek, though. American Science & Surplus is what it says on the tin, full of great, weird stuff. Visit the website just to read the entertaining product descriptions. Deutsche Optik and The Sportsman's Guide both find some eccentric army surplus and related weird cool stuff. Deutsche Optic is at the fancy end of the spectrum; The Sportsman's Guide is more meat-and-potatoes (and features product descriptions with a hint of redneck whimsy). American Giant sells exceptionally well-made cotton basic clothes for men, including a “the greatest hoodie ever made”. 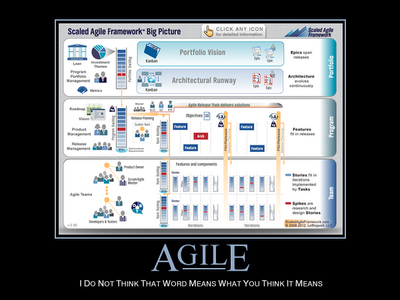 I myself actually have mixed feelings about the Agile software movement — there's a lot to like, but also a lot I'm skeptical about — but I was struck by a tweet by Kerry Buckley looking at that process map. Personally I'd ask if this doesn't mean that the dream of Agile making software development simple (though not easy) through the application of a few key principles wasn't doomed from the start.